Animals have been companions to humans for more than 12,000 years. And today, about two-thirds of households in the US own at least one pet. But did you know that pets offer health benefits as well as companionship? More and more studies are demonstrating that pets, including our four-legged friends can help improve cardiovascular health, reduce stress and its symptoms, as well as improve coping with pain or discomfort. At home and even in the medical care setting, “man’s best friend” is having a positive impact on how people feel. The National Institute of Health has conducted studies with some interesting results. Lowered blood pressure, lower heart rates, increased survivorship after heart attack, and more physical activity are some of the benefits discovered for those with a pet when compared against those without an animal companion. Studies have shown that people who own pets out-live people who don’t. People often find it easier to speak to an animal (or through the animal to a human), as the pet is not judgmental and always accepting. The unconditional acceptance is what creates the long term health benefit. For those who are not well, improved mood and reduced anxiety are some of the benefits that caregivers witness when animals are present in the clinical setting. At Lowell General Hospital, animal visitation has become part of patient care in the Cancer Center and those in cardiac rehabilitation. It provides patients with an alternative method for relaxation and stress management and caregivers notice positive results. When Donna and Siren visit, the dog provides calmness while the nurse gets to discuss stress management, medications, or healthier life choices. 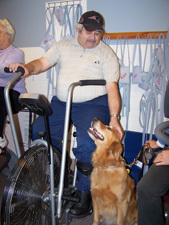 The presence of the dog in the room gets the patients talking to each other and gets their minds off the “chore” of exercise, or worries about their health, and makes for more comfortable workouts. Since Donna and Siren began the pet therapy program in Cardiac Rehabilitation, another team visits regularly, Pam White with her golden retriever, Abbey. Information has shown that using the same dog for all visits is much like a pet owner living with the same animal for years. The “bonded dog”, or the one people have bonded with, will bring about a more relaxed environment more readily than unfamiliar dog visits. Even viewing the photo of the familiar dog or discussing the dog has proven to reduce blood pressure readings and stress hormone levels. So having a pet or visiting one regularly may just be some good medicine – bringing a happier, healthier heart, and a little more relaxation. It is never too late to find new ways to calm the mind and nurture the soul.